Within the tight-knit skateboard community, Riverbank State Park ranksamong the best skate spots in Harlem. 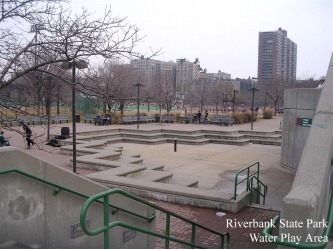 Skateboarders have demonstratedtheir creativity by commandeering three specific sites in and aroundthe park. These skateboarding scavengers have carved out secondaryuses that are not readily seen by the untrained eye. 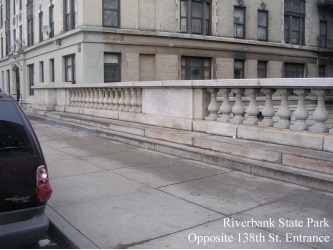 Directly across the 138th Street pedestrian entrance is the firstspace of mention within this skate-cluster. This overpass is apopular congregating spot for youths and teens, and also heavily usedby skateboarders. The wax residue, present on the stair edges, istestimony; skateboarders use wax to make it easier to slide, or grindon certain built-structures. The second space within this triad is located mid-park, behind thetrack and field, and is known as the Sprinkler or Water Play Area.Splashing and laughing kids and families make this site very busy inthe hot, summer months. This space has an additional, unplanned use,for when it would otherwise be empty, skateboarders do manual trickson the concrete blocks. Because this step material is not grindableeven with the application of wax, it is used for manuals—balancing onthe front or back set of wheels while in motion. A series of brick wedges located along the westerly edge of the parkoverlooking the Hudson has also found favor in the skateboarders'eyes. This rounds out this skate-trio as the third and final spot.Here, skateboarders have created a use for an otherwise useless brickincline by rolling up and down these embankments (i.e. banks) likeconcrete waves. Sometimes tricks are performed on the top (i.e. lip)of the bank.